We all have bucket lists right? Or at least we have some grand ideas of things we want to do in our heads but yet to write them down. I have a little bit of both! I have my list of things I would like to do by myself, another list of things to do with my husband and then there is the list of things to do with friends. Regardless of the list, there is one item I have on all of them and I was able to check one of those off this month! What is it? Well, my dream has always been to have the resources enough to at the drop of a hat ( or within days) to say I want to go ……. And then just do it! Yep – last minute travel to somewhere! 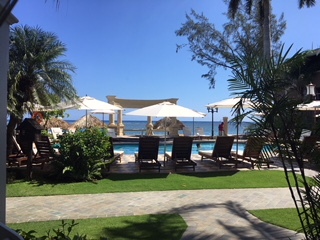 Last week I checked off that by planning a very very last minute trip to Jamaica with a friend, who too is a travel planner with our company. We have traveled many times together and we just know what we both like to do, what we like to eat, when to work and when to relax. You might say we are perfect travel companions in that respect. Our trip came up because I have been caring for my dear mom whose terminally ill and is at home. We don’t have a large family as it is just my brother and myself along with our dad. My brother is out of state but has come in to help as much as he can, but for the most part, I am the closest caregiver. My Aunt wanted to visit from another state and help out so I could get some rest time so when my friend asked if I could get away it seemed like a perfect time. 4 nights in the Caribbean fit the bill. Last minute travel proved to be exhilarating! That may seem like an odd way to put it, but it was! 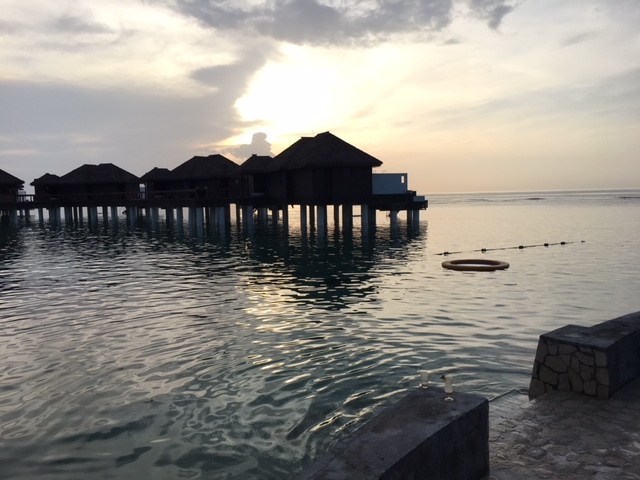 From the moment we said let’s do it and got the ok from our spouses, we searched the resort and booked it, checked out flights and booked those, finished up some household chores, and packed a carry-on of only the essentials and took off! 3 days and we were off! 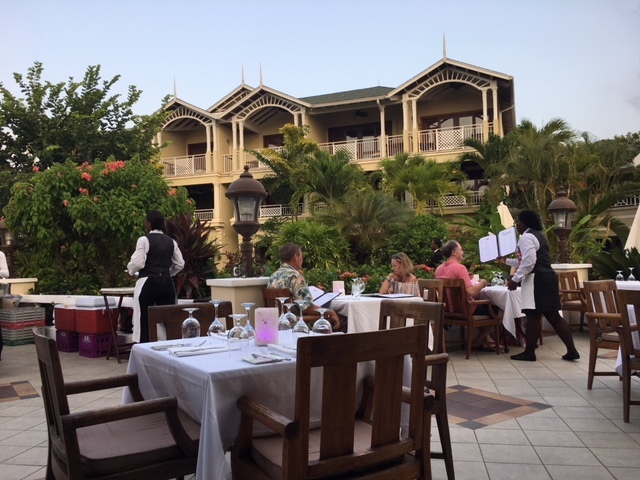 We selected an All- Inclusive, Sandals, Royal Caribbean, as our destination because we didn’t want to worry about where to dine, and what to do. It was all there! Now typically, Sandals isn’t a “girlfriend” getaway, as it is for couples, but we wanted to see it and made it work. With free wi-fi, we were able to keep up with our work and stay in contact with my parents. Packing for this trip was the easiest thing I ever did. It maybe took me 30 minutes! I threw in a few bathing suits since that would be the main activity, a few sundresses, two pairs of shoes, minimum makeup and toiletries, and my computer! That was it. I was sooo proud of myself for having done that as everyone laughs at me because I typically need one suitcase for my shoes and jewels! So since packing was so easy – so was unpacking when I got home! We took advantage of the entertainment provided by Sandals, which was excellent! 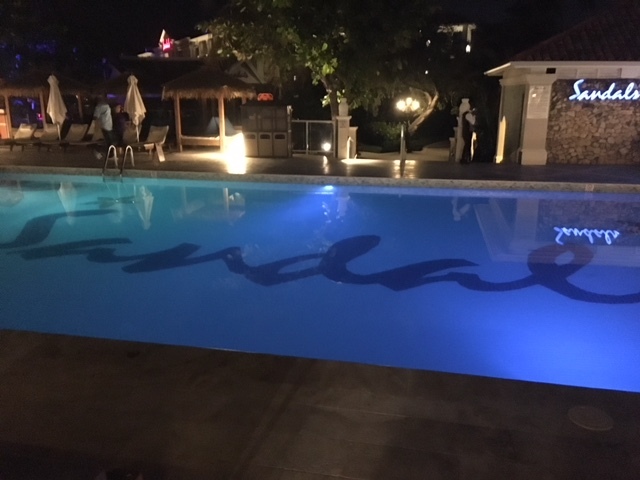 There was something going on every night and since there are a few Sandals properties in the Montego Bay area, you have privileges to utilize all the amenities at each of them so that made it more fun. Our room was in the most perfect location. Just about 20 steps out our patio door was a beautiful pool right on the beach. We had the best of both worlds. I felt a little guilty but I hogged the float for the entire 4 days! I only got off to go running to the bathroom, because our favorite person to see was Clarissa who just handed us our tropical delights right in the pool! Can I say amazing! Our food was prepared and brought to us if we didn’t want to head to the restaurant, and there was such a variety that we felt like we were also on a culinary journey. I have also always wanted to crash a wedding, and even though we didn’t officially “crash” a wedding, we did stroll by several that took place at the resort while we were there. It was hard to resist photobombing, but we remained respectful!! LOL. Destination weddings are very popular and Sandals does know how to make them special. In fact, romance is a fragrance that is all over a Sandals property. Candlelight dinners, photo shoot opportunities, couples celebrating makes for the perfect backdrop. So you see when I say we made it work, we simply enjoyed the resort and meeting all the people. Relaxation was our motive!! I am so looking forward to doing this again someday. It was one of the best getaways I have ever been on and yes it was so exhilarating! This entry was posted in Blog, Bucket List Travel, Travel Planning, Travel Tips and tagged getaway travel, Jamaica, last minute travel, sandals, sandals jamaica on July 29, 2018 by Rick Howard.